Continuing the theme from last year, Minister for Finance Paschal Donohoe has said that his ‘gradualist’ approach to tax reform and public expenditure will feature in his second Budget speech, which is due to be announced on 9th October 2018. This, he hopes, will keep the economy under control while making provision for the multiple disruptions facing the Irish and international economy. With a focus on resolve and resilience for the future challenges, Minister Donohoe has stated that the government “will frame budgetary policy on the basis of what is right for the economy in order to ensure steady improvements in Irish employment and living standards”. But how do the substantive changes that appear in the Budget impact your business as you look toward 2019 and beyond? PwC’s Wexford 2019 Budget Breakfast Briefing in association with Wexford Chamber on Wednesday, 10th October 2018, will provide insight on the measures announced and what they will mean for you and your business. 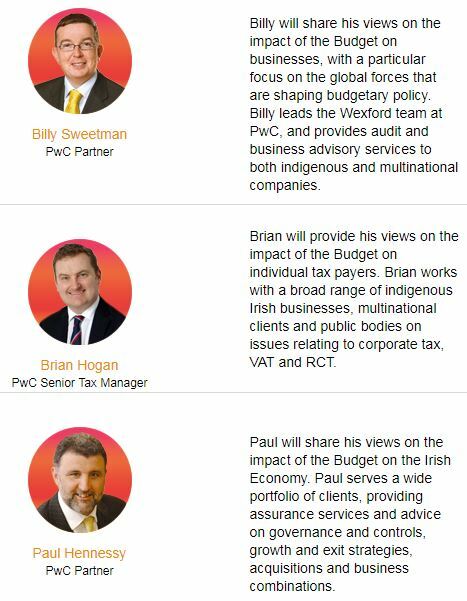 PwC’s team of specialist professionals, Billy Sweetman, Brian Hogan and Paul Hennessy will share their views on Budget 19 and the general economic outlook for the year ahead. This is one of the best attended events every year so we recommend that interested attendees book early! We look forward to seeing you on the morning. RSVP: Email traceymorgan@wexfordchamber.ie or phone Wexford Chamber on 053 91 22226. By attending this briefing you may be eligible to earn CPD points. Please contact your awarding body for further details.